There are some years that are easier than others, just like there are some years that are frustrating. Some of the frustration has to do with how we, as professionals, are treated by our principals. Maybe they just don't quite understand our position in their schools. I have enlisted the help of other SLPs throughout the country to come up with a few things that may help out principals when they're scratching their heads, not knowing what to do with us. 1) I'm busy...you're busy. Emails are the best way to communicate; I can quickly check emails between groups or at the beginning/end of the day. Basically, whenever I have a moment, I can check them. I will respond to your emails as soon as I can, and would greatly appreciate you responding to my emails in return. 2) While we're on the subject of emails, please remember to include me in your emails. I am a member of your faculty and want to be included with my peers. I don't want to be an after-thought by being included with non-certified personnel as a cc. 3) Please watch your familiarity with me. While I may be your friend outside of school, when we are at school, you are my principal, not my friend. Referring to me (either through emails or verbally) using what you perceive to be an endearment, is, in fact, demeaning to me and gives me the impression that you do not value me as a professional. 4) When we are in a meeting and you do not agree with my recommendations, please ask to see me in the hallway. It is important that the parent has confidence in his/her child's educational team. If the meeting is not clear-cut, I will speak with you prior to the meeting (or have a pre-meeting to discuss recommendations with the school team)to make sure the meeting runs smoothly. 5) My time is valuable, as is yours. If you have a faculty member who requires some "redirection", please talk to that individual. The whole faculty does not have to be addressed, and, the chances are, that individual won't think it's him/her that is guilty of the infraction. 6) My job is important. You may think that all I do is play games with students and work on speech sounds, but my responsibilities encompass so much more. I am an integral part in giving students the necessary language skills for literacy. I know a thing or two about a child's development as well as necessary skills for educational success. I know how to give a child who stutters the confidence and the skills to answer out loud in class and to give an oral book report. 7) Lastly, if you see me in the hallway, I'd love it if you would acknowledge me. I don't need to feel more important than anyone else, but I do need to know that if I need to come to you with an issue, you'll be available to me. I won't come to you with every little thing, but it is your building and you need to be aware when issues come up. Just acknowledging me with a "hello" or even just a smile & head nod will help me feel comfortable enough to knock on your door and have a professional talk. 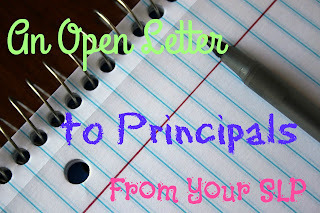 If you're a principal and you're reading this: thank you. If you, as a principal, are able to look at each of these items and know that you are doing these things: thank you! If you can't check off these items, hopefully I have given you something to think about. As Speech Language Pathologists, we have all gone through a strenuous Master's Program. We are specialists, just as the literacy leader and psychologist are specialists. We all want to be treated as the professionals that we are. We want to be respected...we want to be part of the team. I can relate with #2, 6 and 7 from past experiences! My husband is a principal and I forwarded this post to him. I'll have to update you with his feedback. I wish all principals would read this! Thank you for taking the time to write this post. I am very fortunate to have worked with wonderful, professional principals who treated me as a member of their team/staff. I do believe that as SLPs we may be in a building very infrequently due to traveling around districts and in those situations we definitely need administrators to read this perspective as often times they don't even have a chance to learn our value.